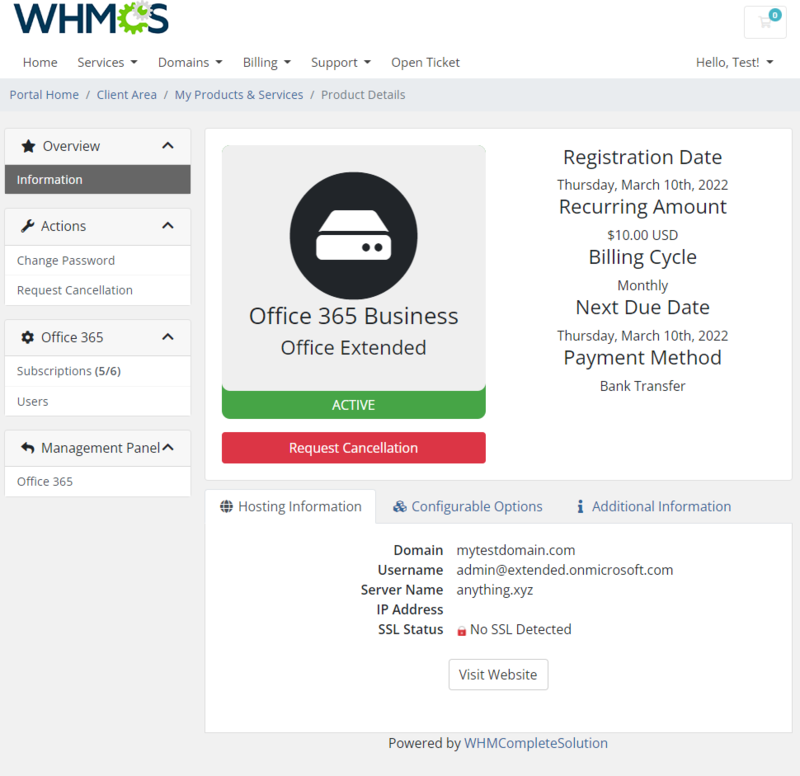 Office 365 For WHMCS has been designed to let you automatically provision Microsoft Office 365 plans and remotely manage their key features. 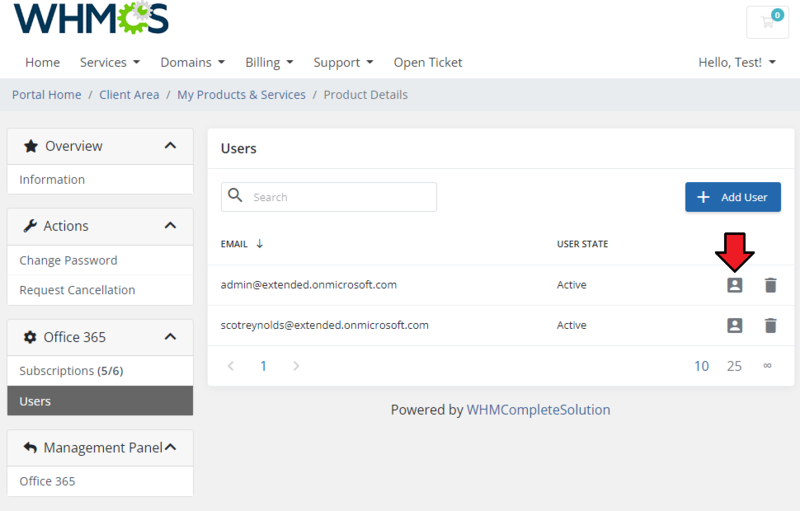 With this module, you will easily supervise all subscriptions, perform switches and suspensions as well as password changes right in your WHMCS. 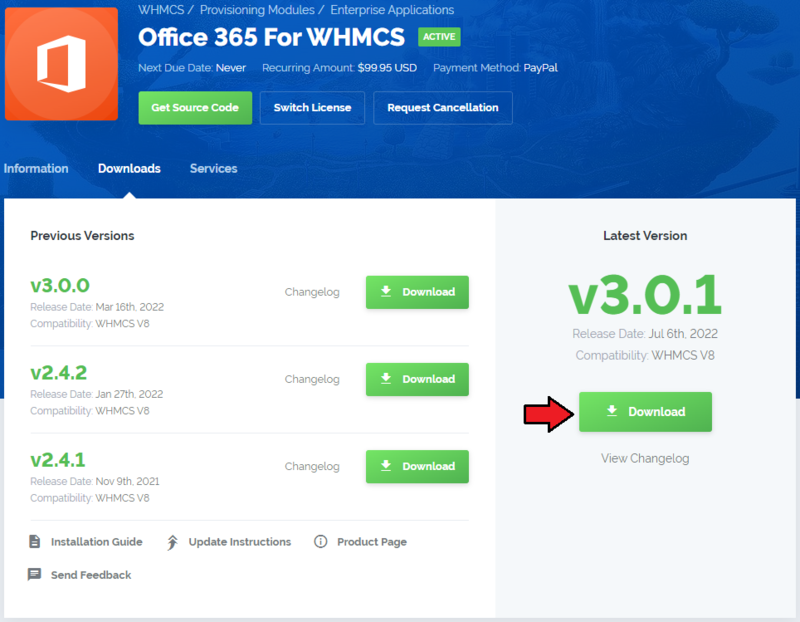 Please be informed that Office 365 For WHMCS 2.0 is not compatible with its 1.0 version due to the changes introduced to the creation process of subscriptions and users. If the mechanism available in the 1.0 version suits your requirements, do not update your module to the latest version. 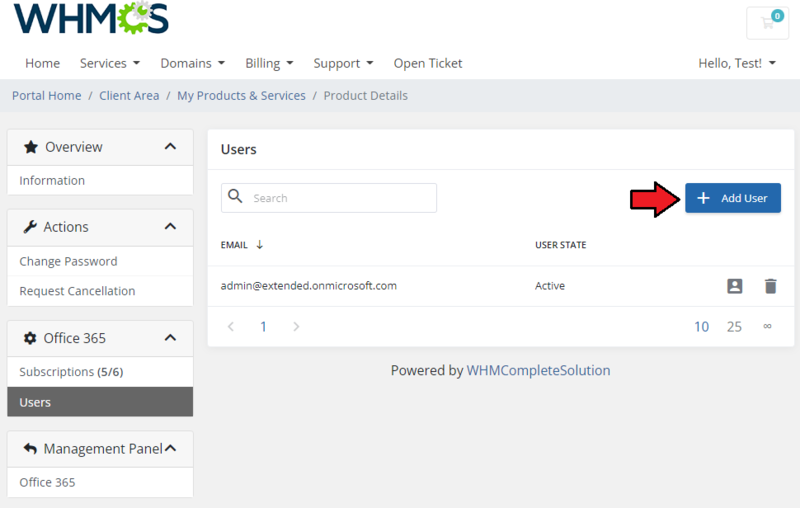 This tutorial will show you how to successfully install and authenticate Office 365 For WHMCS. Important: This module configuration requires a Microsoft Partner Network account with CSP Direct (Tier 1) Model. 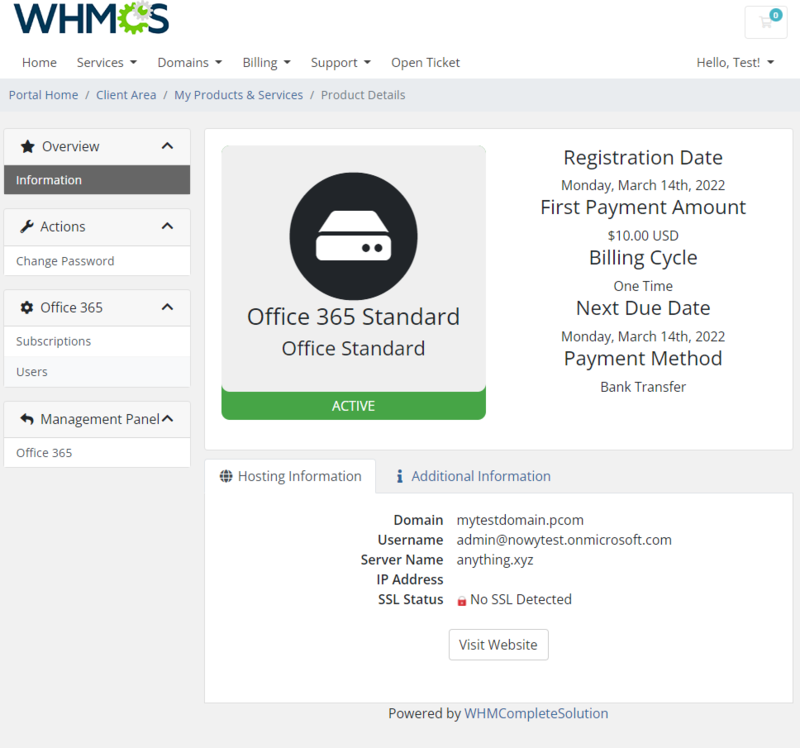 Note: If you are still using Office 365 For WHMCS version 1.0.0, read about it here. 4. 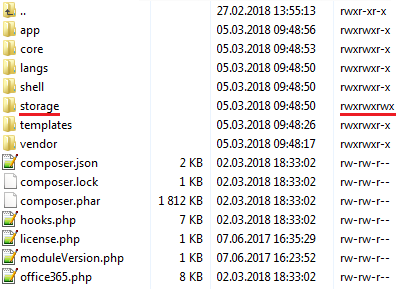 When you install Office 365 For WHMCS for the first time, you have to rename the 'license_RENAME.php' file. The file is located in 'modules/servers/office365/license_RENAME.php'. 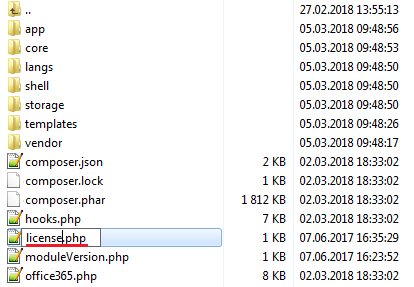 Rename it from 'license_RENAME.php' to 'license.php'. This folder is located in 'your_whmcs/modules/servers/office365'. 7. To begin, you must add a new server. 8. Enter your server name. Choose 'Office365' from the dropdown menu. 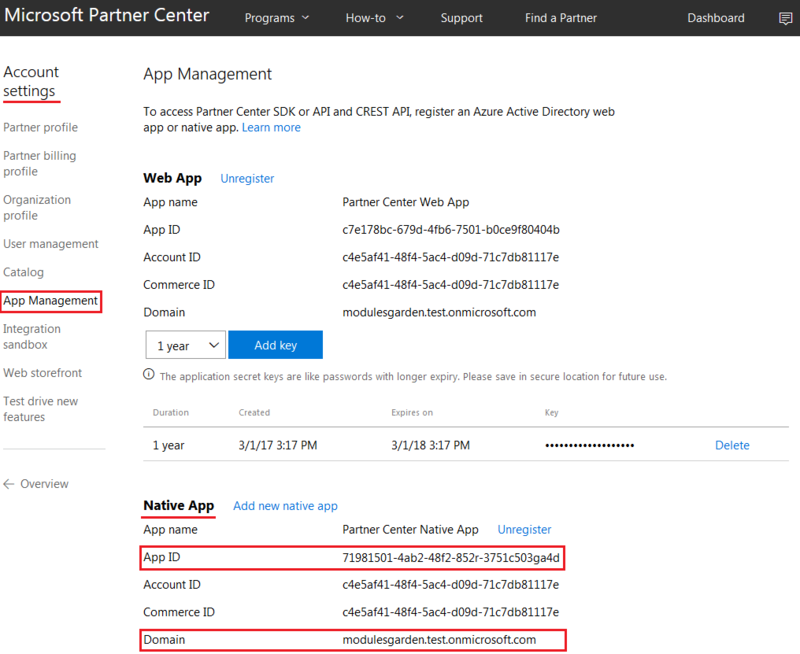 Now, enter your Microsoft Partner username, password, API URL, Native APP ID and Domain (see steps below how to obtain them). Test connection and, if successful, press 'Save Changes' . In order to create full 'API URL' , go to 'Microsoft Partner Center' panel → 'Account Settings' → 'Organization profile' and copy 'Default domain' from the section marked on the screen below. Next, put it in 'https://api.YourDefaultDomain/v1/' address and paste to server configuration as your 'API URL' . 9. Once your server has been configured correctly, you will see the following screen. 10. Enter a name, click on your previously created server, press 'Add' , then 'Save Changes'. 11. In order to create a product, go to 'Setup' → 'Products/Services' → 'Products/Services' . If you do not have a product group, click on 'Create a New Group' . If you do, simply move to the 12th step. 12. Fill in a product group name and press 'Save Changes'. 13. 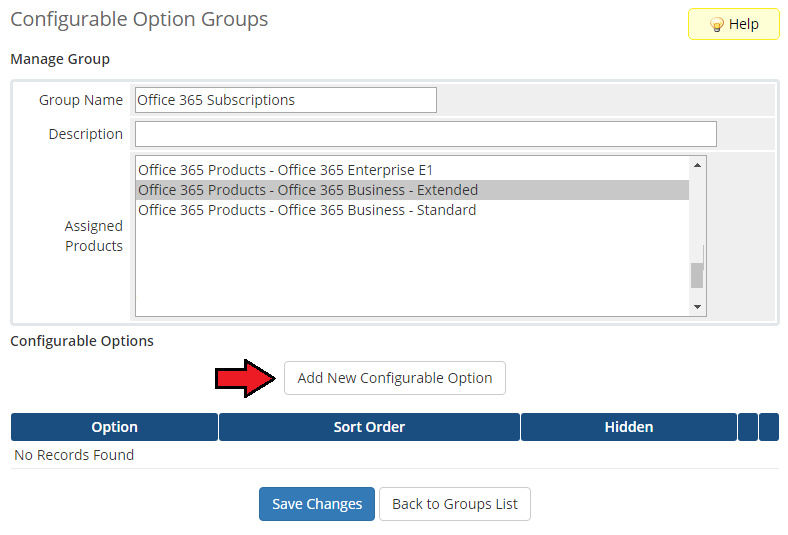 When you have a product group added, you can create your product and assign it to the Office 365 module. 14. Afterwards, choose your product type and product group from dropdown menus, enter your product name and press 'Continue' . 15. 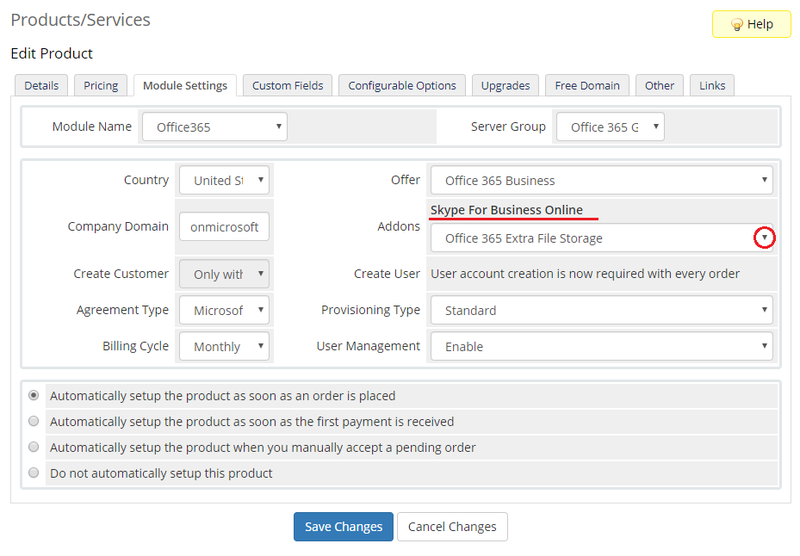 Now, go to the 'Module Settings' section, choose both 'Office365' and the previously created server group from the dropdown menu, and press 'Save Changes' . 16. Then, go to the 'Custom Fields' tab and make sure that it displays the three created 'text box' custom fields. These are: userid|User ID, orderid|Order ID and customerid|Customer ID. If they were not automatically created, then add them manually as shown on the following screen. 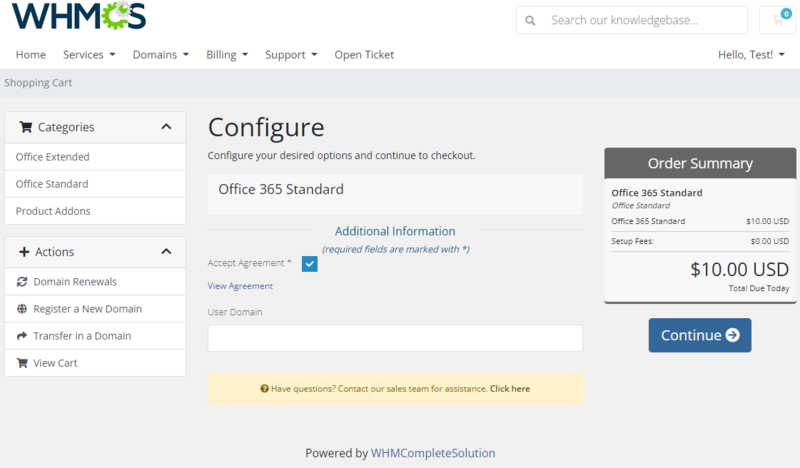 Configuration and management of Office 365 For WHMCS is very intuitive. Before you start, please note that there are two provisioning types you can offer to your clients. 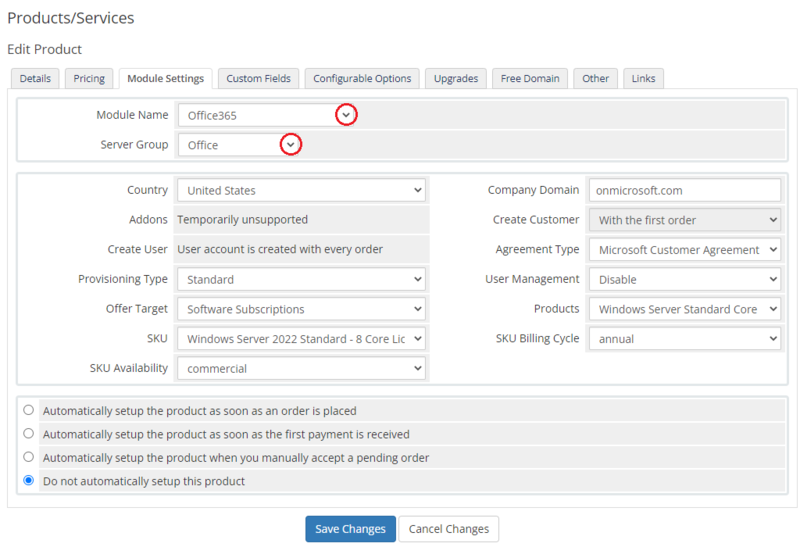 Standard - this will automatically create for your WHMCS client the new Office 365 customer with user and subscription based on the chosen module settings. 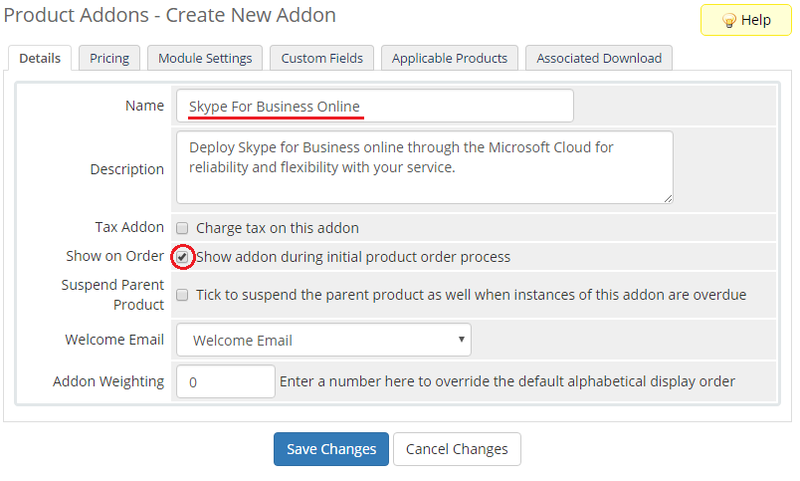 Extended - this option will automatically create only the Office 365 customer and the first user. 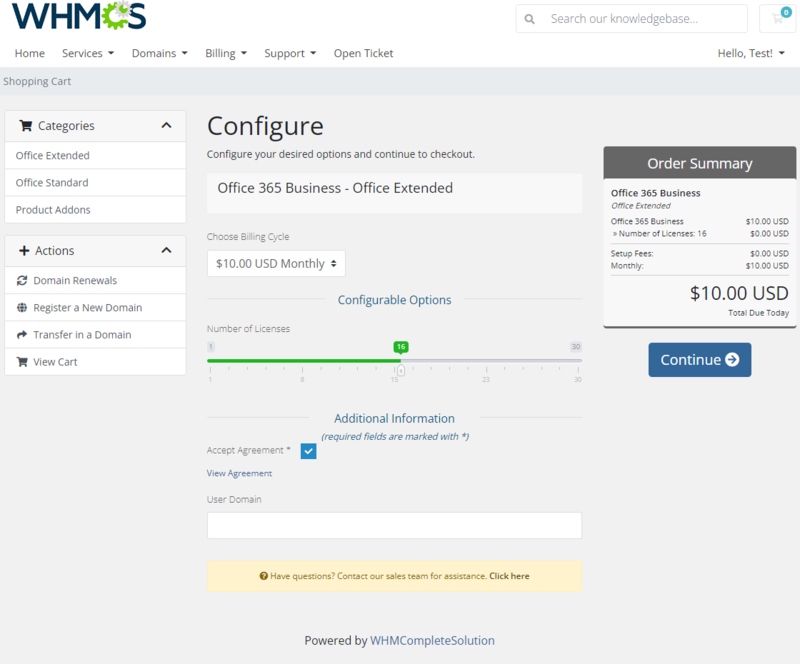 It will be also up to the WHMCS client to choose how many subscription licenses to buy during an order. Then, after order provisioning, the client can decide to create manually additional Office 365 users and assign the purchased subscriptions to them. Let's start the module configuration by choosing 'Standard' provisioning type. Now, choose 'Country'. that you will offer your Office 365 services from. Select also the available 'Company Domain' and choose one of the desired Office 365 plans. 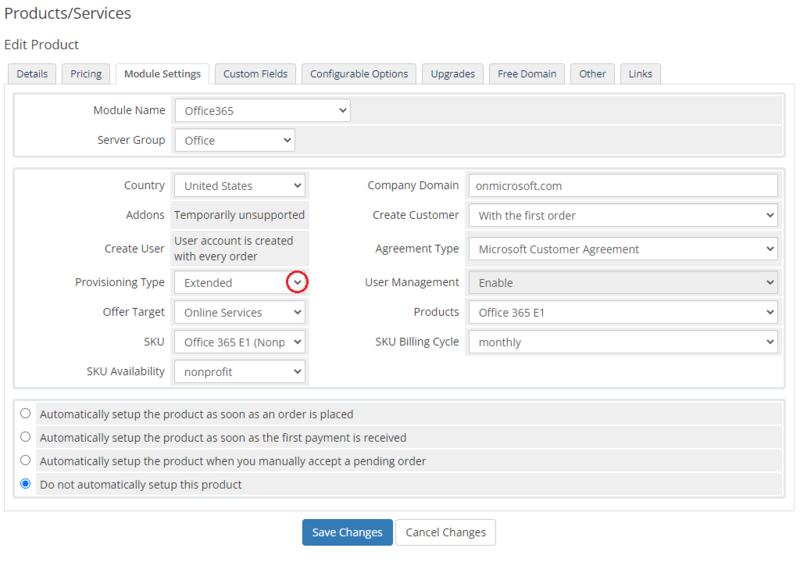 Next, decide whether to create Office 365 customer or user per WHMCS client only after first order or create them every time for additional orders. You may also assign additional services to the main plan as addons - they will be described in further parts of this documentation. Note: Available subscription offers and additional services depend on your Microsoft membership coverage and may be limited by the location. In order to offer additional services for a standard product plan, you need to create a new addon first. 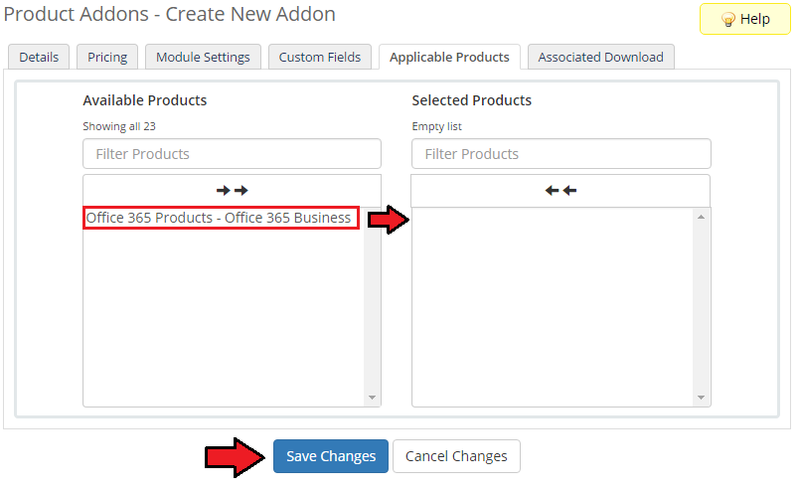 In your WHMCS system press 'Setup' → 'Products/Services' → 'Product Addons' and select 'Add New Addon' . Important: addons are applicable only to standard provisioning type, not for extended one. Enter a name of the addon, choose the addon to be visible during the ordering process and configure the rest of the desired options. Go to the 'Applicable Products' tab and select the product that you want to offer this addon for. Then press 'Save Changes' . Important! Please leave both: 'Module Name' and 'Server Group' set to NONE in the addon module settings. Selecting any server or module here will surely end up with an error! 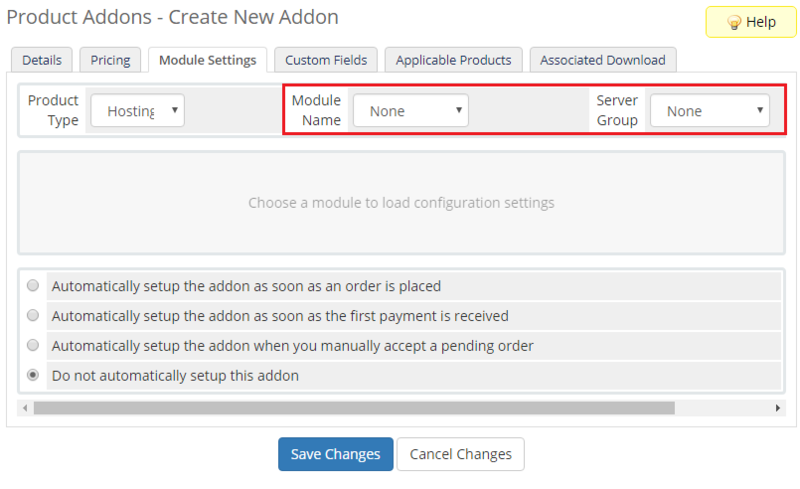 Go back to your product and connect the created addon with one of the available additional services in the 'Module Settings' tab. Finally, 'Save Changes' . Remember that you can also add more addons for services. Once the product configuration is complete, clients will be able to order the selected subscription and addons. Standard provisioning type does not support any additional features in the client area. 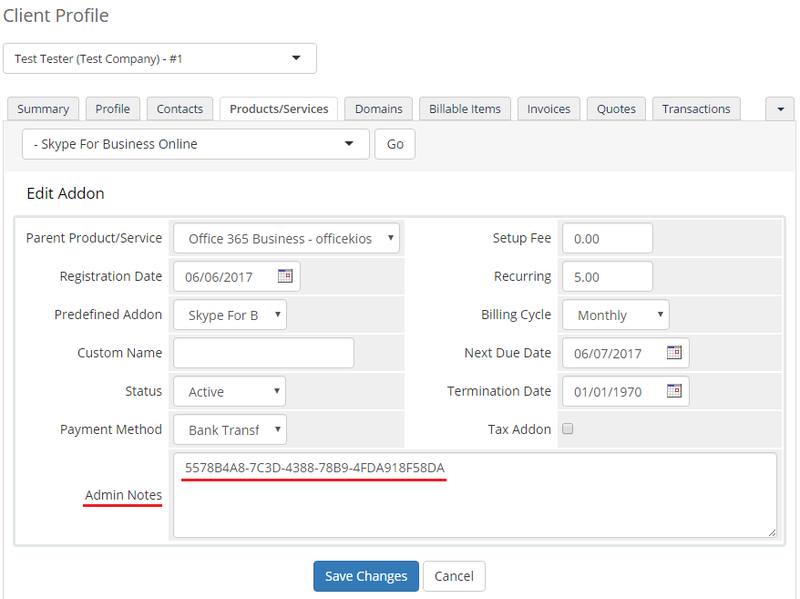 The customer can order additional services to their subscription, change their password to the Office 365 panel, upgrade a subscription plan or request a service cancellation. Extended provisioning type allows your client to order the chosen number of licenses using configurable options and then manually redistribute them in their client area among the created Office 365 users. Enable this configuration type by choosing the 'Extended' provisioning type in the module settings of the product. Now, choose 'Country' that you will offer your Office 365 services from. Select also the available 'Company Domain' and choose one of the desired Office 365 plan. Note that for this mode you 'cannot assign any additional services to the main plan as addons. 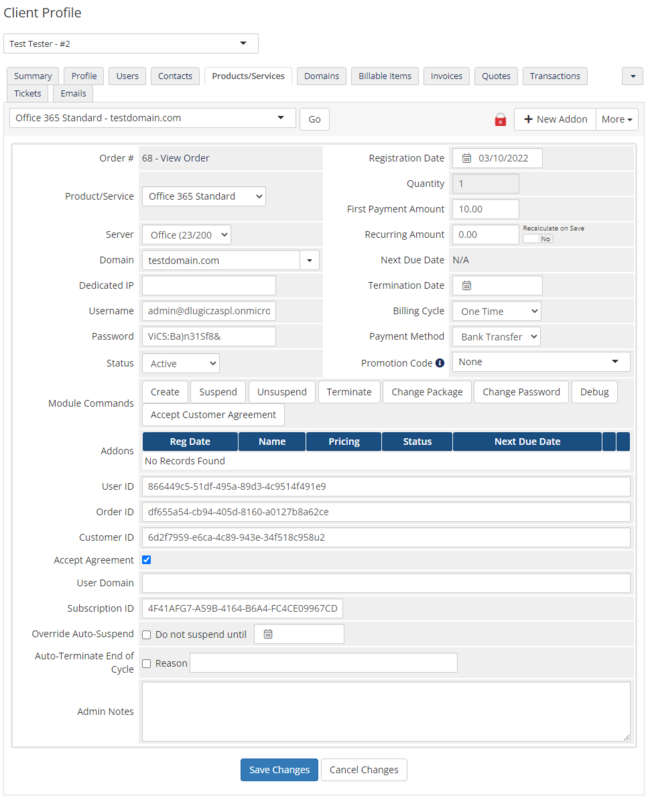 To allow your clients to purchase multiple licenses at a single order, you must create configurable options for a product . Start by going to 'Setup' → 'Products/Services' → 'Configurable Options' and press the 'Create a New Group' button. Enter a group name for the addon and select products that you want to offer this option for. Then press the 'Save Changes' option. Now, press 'Add New Configurable Option' and the new popup window should open. Name this configurable option as 'office365licenseQty' with the desired friendly name. Next, chose the 'Option Type' you want to use and add pricing for the desired quantity. Note: More information about setting up configurable options can be found here. Once the product configuration is complete, clients will be able to order the selected number of subscriptions. After order your clients will be able to manage Office 365 users and subscriptions by themselves. The menu also displays information about the current number of used subscriptions. Before you start assign subscriptions, you have to create new users. By default there is already one Office 365 user created based on the customer account. Your can add more users and then assign to them the purchased subscriptions. Fill in the required data to create a new user. Then, after successfully creating a new user, you can view their account details. In the user profile you can view account details as well as assigned subscriptions. Press the 'Add Subscriptions' button to assign a new license to this account. You can assign multiple licenses to one account, provided that the number of used subscriptions is not exceeded already. After successfully adding licenses to user account you will see their number, status and validity in the user's 'Subscriptions' box. 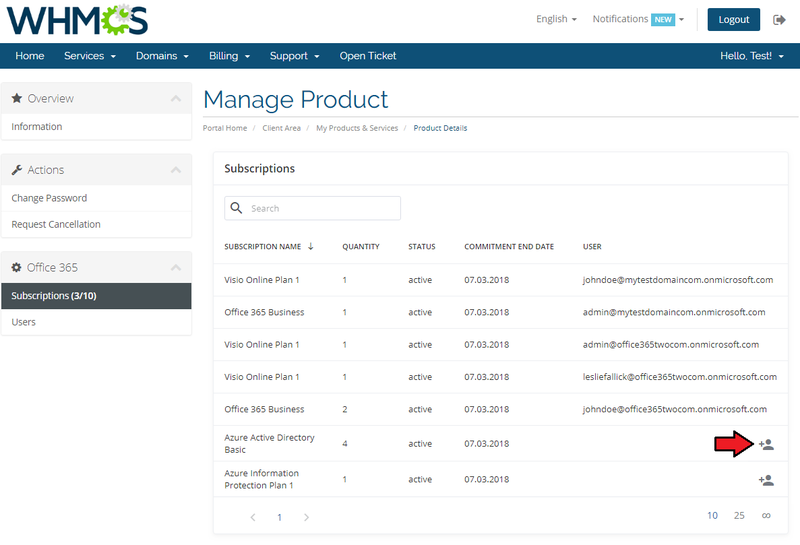 The 'Subscriptions' section displays all product licenses that are currently assigned to a user. 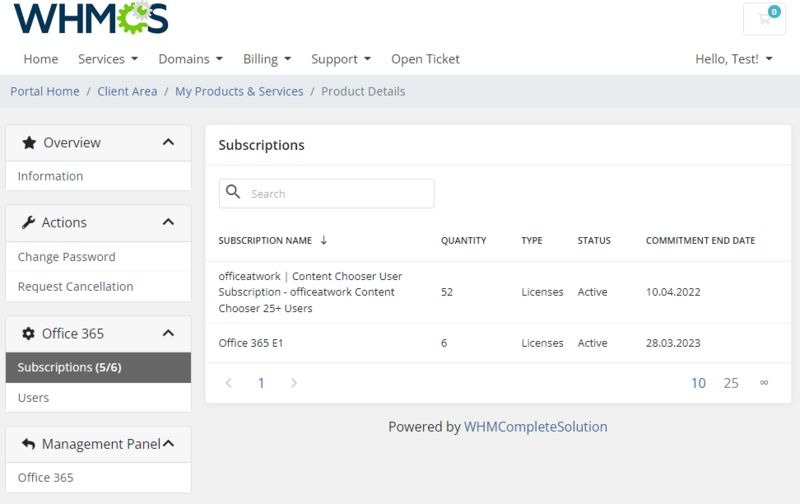 For your convenience, if product settings have been configured to create only one Office 365 customer per WHMCS client, then all other purchased subscription types will also be displayed here. Nevertheless, please note that the subscriptions counter will display usage for the currently chosen product only . If you are using the module, we do not recommend assigning subscription directly from the Microsoft panel. However, if such a situation occurrs, the subscription will be fetched to the WHMCS list, but then you will have to assign it to the user manually. In the newly opened window select the user to whom the subscription will be assigned and press the 'Assign' button. Let's check your new product in the product page in admin area . After a successful creation, it should look exactly like presented on the screen below. Note The admin area for both standard and extended provisioning types looks basically the same. The 'Username' and 'Password' are used to sign up to the Office 365 panel. The 'User ID' , 'Order ID' , 'Customer ID' and 'Subscription ID' are custom fields used to connect the product with the created subscription in your Microsoft Partner Center. 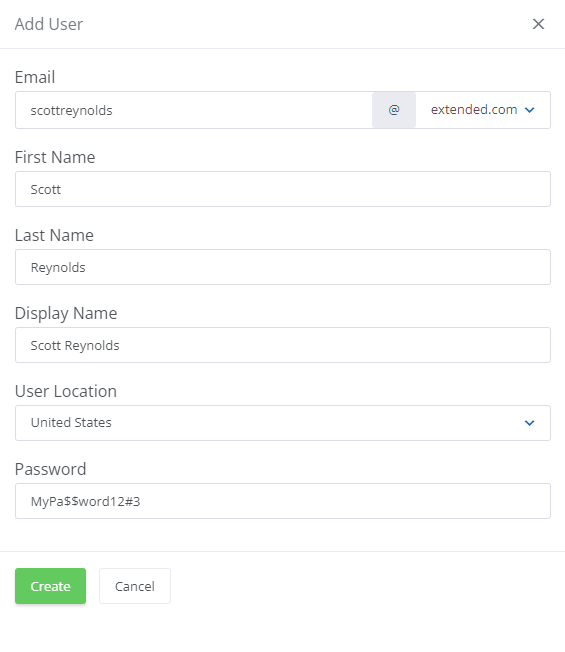 Depending on the product settings, the common 'Customer ID' and 'User ID' can be used for connection if one client buys more than one subscription. Due to API limitations, ordered subscriptions can only be suspended or unsuspended. For this reason, the 'Terminate' command will work in the same way as the 'Suspend' option. In case of standard product suspension, all addons that belong to the product will also be suspended. If the product is unsuspended, its addons will remain suspended. For extended provisioning type this action action will also cause the suspension of all subscriptions assigned to the customer and their users. 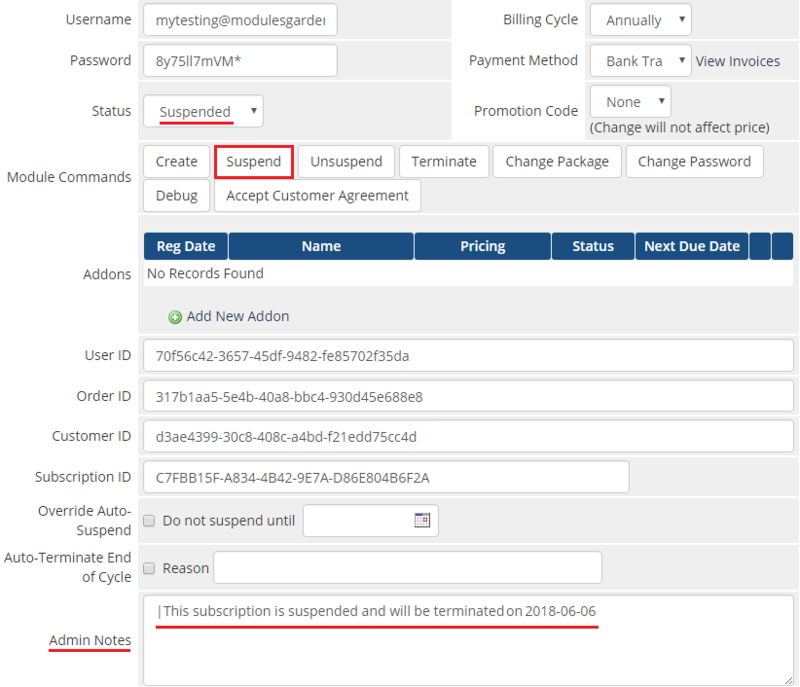 Information about product suspension will be shown in the 'Admin Notes' field. Provide a new password → Press 'Save Changes' → Press 'Change Password' . 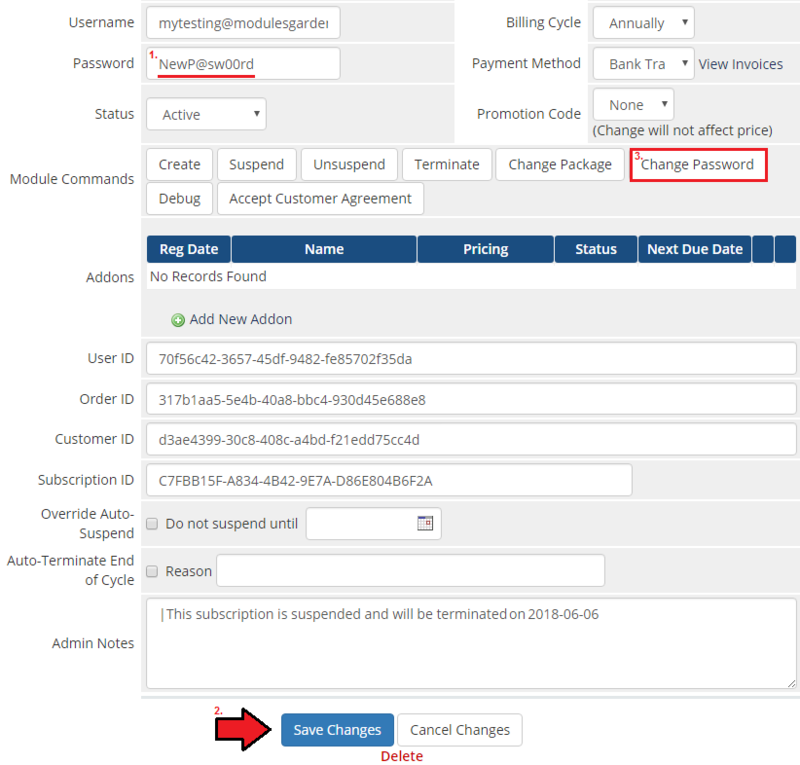 By using upgrade/downgrade feature you can change subscription type for the standard provisioning type. However, for the extended provisioning type you can only change the number of assigned licenses by configurable options, not the subscription type itself. Note that you cannot also downgrade the number of licenses to smaller quantity if that number already exceeds the number of used licenses. Information about addons will depend on their status and will be shown in the 'Admin Notes' field. By default, the 'Subscription ID' service should be provided. Note that the addon can only be used for the standard provisioning type. For example, if the addon is suspended, the information will also appear in this field. 1. 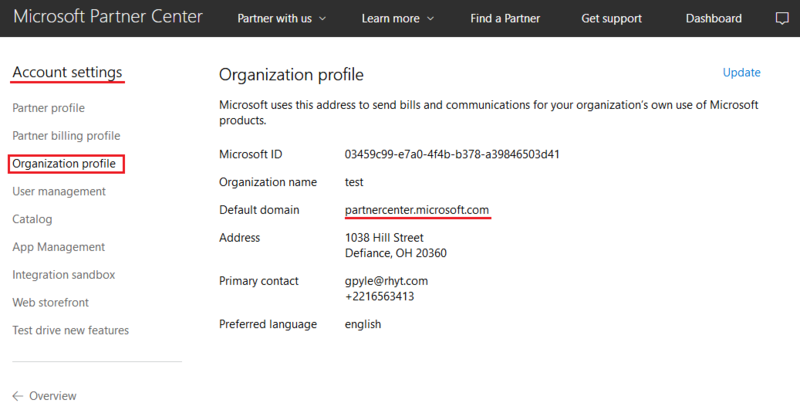 For more information on how the Microsoft Partner program works, see here. 2. API responses can be translated in the module's language file. To do this, add a new record in the file with the received API message and your translation. While using the 2.X version of our module, note that no data can be migrated from the Office 365 For WHMCS version 1.0.0, so the module needs to be configured from scratch. This also means that previously placed orders for subscriptions will not work on the new version, even after module reconfiguration. 1. When you have problems with connection, make sure that SELinux or firewall does not block ports. 2. 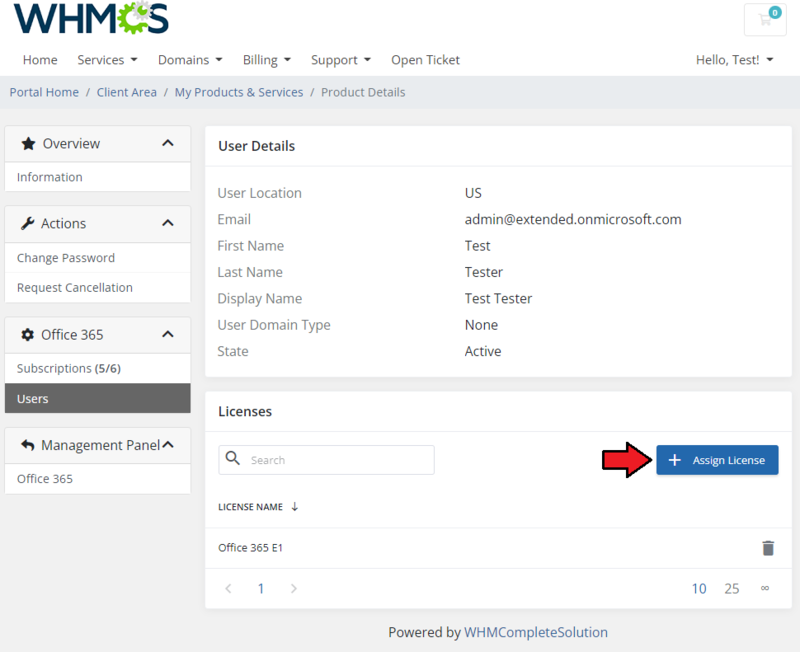 The list of users and their subscriptions assigned to the customer directly in the Microsoft panel are not automatically assign to the WHMCS client and their users. This is due to the API limitations, so this list is only kept locally on the WHMCS server. In case of changes made directly in the Microsoft panel, such modifications might then be made manually in the module to reflect changes locally. indicates that a single customer may purchase only one license (Office 365 Business, Office 365 Business Essentials, Office 365 Business Premium license etc). This page was last modified on 8 March 2019, at 09:12.